What’s up women of the world! Today we are wrapping up Psalm 119! We have loved going through this together as there is so much good truth in this chapter. We believe that you will be encouraged as we finish up with this last stanza of Psalm 119. This author is in need and is asking the Lord to intervene and to remind him who He is in the Lord. He wants to understand as he as he asks for the Lord to deliver Him from His enemies. Maybe something hard is happening in your life right now and you are desperate to know why: a death of a family member or an illness. Cry out to God before you cry out to anyone else! We have to bring our sin to light and flee from it. If we are walking in sin, crying out to the Lord to take it out of your life, yet not walking “according to God’s word”, then you are missing it. God’s word tells us to bring our sin into the light, and then to repent from it. The Bible is not a road map or a magic 8 ball. It literally gives us the answers on how to live a Godly life. We pray that we would hate our sin as much as He hates our sin. Habakkuk 1:13 says, “His eyes are too pure to look upon evil…” which is why He sees Jesus when He looks at us if we have trusted in Him. Once you have salvation, there is NOTHING you can do to lose that. If you know God, you can’t just walk away from Him. As believers, we have the ability to constantly be seeing the blessings of the Lord. Sometimes it is hard to see the “little good” things that God gives us throughout our day. Take the time to thank Him throughout your day for the smallest and largest of gifts. Are you praising God for the things He is teaching you and revealing to you through His Word? Whether you have a good voice or not, God tells us to sing praises to Him! We can’t always see what’s ahead and we can’t always see what the Lord is doing, but we can praise Him and trust that He has a plan in the midst of the unknown. When we ask God to help us, God promises us that He will! We know He is going to uphold us. He is strong. He is all powerful. It is easy for Him to help us. Who else is better to help us other than the Lord Himself? Difference between the Old Testament and the New Testament: Jesus has not yet come in the Old Testament. In this verse, the Psalmist is probably crying out for the Lord to save him from something physical, yet the Lord still rescued His people in the Old Testament. We as believers on this side of the cross can cry out specifically to Jesus and ask Him to save us from sin. No matter the despair or hardship you go through, our souls can still live and praise God! When you write God’s Word on your heart, it comes back when we need it. The Holy Spirit uses it to encourage you! It is ok to not be ok, but it is not ok to stay that way. We see the analogy and reference to sheep throughout the Bible. Isaiah 53:6 says, “All we like sheep have gone astray; we have turned–every one–to his own way; and the Lord has laid on Him the iniquity of us all.” Although this is the Old Testament, the author is referring to Jesus who is to come-how God will lay all of our sin onto Him. Matthew 15:1-7 describes Jesus going after the 1 lost sheep out of 99 which demonstrates how Jesus comes after us even in our sin. But Jesus longs to be in a relationship with you and is seeking you out! As believers, we go get our friends who are turning from the Lord and walking in sin. We fight for our people. It is always worth it! Let’s be women who fight for each other in righteousness. We don’t talk about them behind their back, we don’t slander them, but we go after them. We have so much enjoyed going through Psalm 119 (the looongest chapter in the Bible with you)! 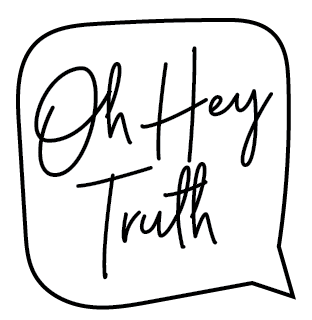 Stay tuned to see what’s happening next here at Oh Hey Truth as we start a series on Philippians. Follow us on Instagram at @ohheytruth. Leave us a review on iTunes. Let us know what the Lord is teaching you through His Word. We love you ladies!